More than 72 million people around the world were forced to leave their homes last year as a result of disaster, conflict and development, a new report has revealed. The World Disasters Report 2012 by the International Federation of Red Cross and Red Crescent Societies (IFRC) also says that disasters caused $350 billion in damage, the highest figure in over two decades. The IFRC says that the high cost is despite the fact there were fewer disasters in 2011 than in recent years, with large scale disasters such as the Japan tsunami, Christchurch earthquakes and floods in Queensland hitting developed countries. Acting chief executive of Australian Red Cross, Michael Raper, said that the World Disasters Report shines a light on the growing number of people displaced by conflict, violence, persecution and political upheaval, natural disasters, and large-scale development projects. "The issue of refugees and asylum seekers tends to cause great debate in Australia but of the tens of millions of people around the world displaced by conflict, persecution, disasters and development last year, less than half of one per cent came to this country," Raper said. 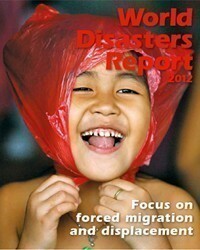 The World Disasters Report 2012 is focussed on forced migration and on the people forcibly displaced by conflict, political upheaval, violence, disasters, climate change and development projects. The IFRC says these numbers are “increasing inexorably” each year. "Right now the world is facing a humanitarian crisis of forced migration in Syria where more than 1.2 million people have fled their homes due to the fighting and around 340,000 refugees have crossed into neighbouring Jordan, Lebanon, Iraq and Turkey,” Michael Raper said. "There is a real risk people fleeing the conflict in Syria will join the 20 million forced migrants worldwide who are living in a state of prolonged displacement, typically unable to work or access social services. The World Disasters Report analyses the causes of forced migration and its consequences and impacts on displaced populations, their hosts and humanitarian aid workers. It looks at the significant gaps in humanitarian protection for ever-increasing numbers of forced migrants who do not fit into conventional categories of protection, and the public health challenges caused by forced displacement, particularly for women, children and those with mental ill-health problems. United Nations High Commissioner for Refugees, Antonio Guterres, said that forced displacement is one of the most acute and visible consequences of disasters and conflict. “Its scale and complexity have increased dramatically in recent years,” Guterres said. “The World Disasters Report 2012 makes a critical contribution to our understanding of how the changing nature of conflict, climate change, population growth and urbanization interact with and accentuate vulnerability.